I have gone to the extremes of finding the perfect swim suit. I have spent Hours upon hours spent online shopping, Victoria Secrets, Venus, to name a few. There have been countless hours trying on swimsuits in local department stores, with small children! Which you know is as successful as making your children sit down and eat their lunch at a place that provides a children’s playscape! It’s more of a struggle then an accomplishment. Not to mention to all the dollars spent on these expensive swimsuits! Why? Because if it holds everything in place, really good, its going to cost some extra dough! I’m sure my husband never really minded this process though, after all, I wanted to share with him my favorites and get his opinion on which suit he liked the best. 😉 It’s a hard job to have to check out all these gorgeous swimsuit models, but someone had to do it! This year I dared to do something different. I can honestly say that I didn’tt window shop, online shop, or catalog shop one time this preswimsuit season. I actually fell in love with the look the little Lifeguards were pulling off at our local YMCA. Sporty and Modest. I thought to myself, I work out, why not!? With Birthday cash in hand, we made our way over to Academy and as dear husband took the kids to check out all the sales the store had to offer, I shopped alone. I went straight for the ” lifeguard swimsuit area” and fell in love with a super cute, super sporty one piece swimsuit. I tried it on, in hopes I would only have to try one swimsuit on this year, and too my surprise felt happiness in the eye picking choice I made. It fit my body and it was comfortable. No room for the girls slipping out or having to stay completely sucked in for the entire duration of swim. I felt confident in my choice and made my purchase! Oh and I have to add that it is reversible. One side is a safari print, the other black with hot pink trim! (The picture below shows like and blue because I couldn’t find the black and pink!) The price tag of $60 in my opinion was a steal. I had to hurry up and buy it before the company realized they were selling an awesome suit, two really for the price of one!! I have to note, this is the cheapest amount I have spent on a swimsuit in the past 10 years as well! My older swimsuits, to their defense are cute, but they were premediated, and searched for through out all ends of the retail world, haha just kidding, although at the time it did feel like it! Keep this in mind for what I am about to share with you! I get home from Academy and try my swimsuit on for my husband, to my surprise, he loves it! I don’t know why it tickled me so but it did. AT LAST, after 10 years, He finally compliments my swim appearal on his on, with out any baiting on my part! SUCCESS! The moral of this story is to chill out about your swimsuit! 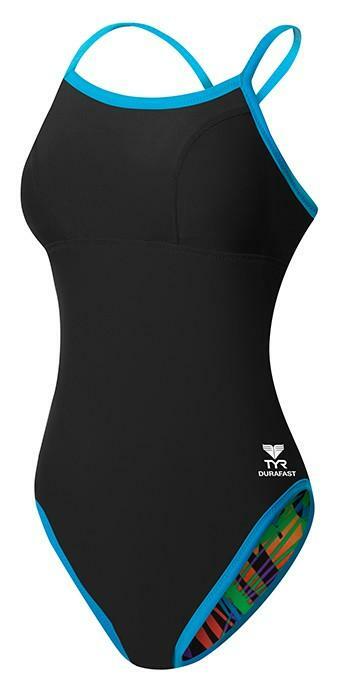 Don’t over think it, and put too much pressure on finding the perfect swimsuit. When we give up the pressures of perfection, there is beauty in what happens when we just let things be, accept our mom bodies, love them, and adapt to them as we need fit. It is noting fancy, but it is something that makes me feel good when I am in it. With the added bonus of knowing that if I move a certain way or bend over, I don’t lose everything I got! My kids are finally at the age where we can play and engage each other in a wide variety of water activities. I am all set to just have fun, and not focus on if my suit is in place!